Slightly edgy stuff for the weekend for fans of airmass battles. Current weather is in a BLOCKING pattern with a HIGH NE of the UK over Scandinavia blockiing the passage of a LOW pressure cyclone which has been cut-off down off the west coast of Spain all week. It’s gradually filling and has been wafting a lot of nice warm upper air our way from the South, hence our mild temps for much of the past week and the stagnant weather… not much happens when the jetstream abandons the country! 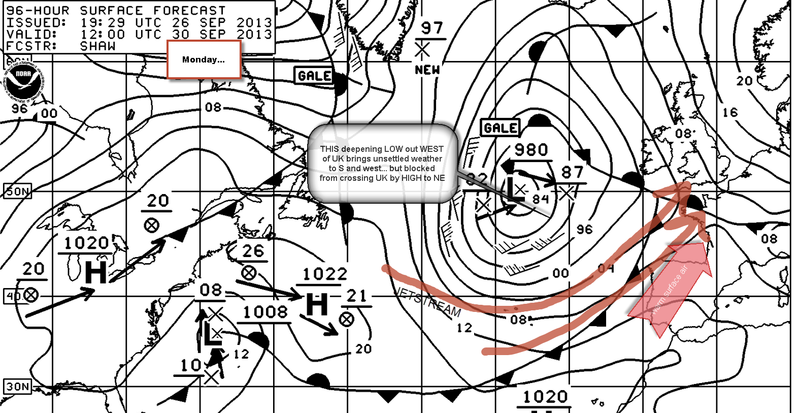 This usually means the weather (good or bad) stays much the same for ages until the BLOCK moves or the JET returns. However, the weekend heralds a change, of sorts, for next week. The HIGH over Norway is building and will increase the pressure gradient as the LOW sneeks up the Channel. A brisk easterly wind generated by the pressure gradient will push the relatively drier continental air (from the HIGH) right into the warm, moist upper air arriving from Spain. The result will be lots of rain in the SW and for the Channel. Some of this will be heavy and possibly thundery on Saturday and any slight change in the location of this marriage of airmasses could bring rain anywhere to the south. The fronts are not now expected to push much up from the coast or out of the SW. However, whilst a dry mostly cloudy day is forecast for the weekend in the SE, with so much action nearby, we shouldn’t rule out the possibility of a shower. This is especially the case on Sunday afternoon when, despite a good general forecast, the fronts do wiggle closer up the Channel and might deliver some showers in the afternoon. The SE and Reigate are on the dry side of the front but humid showery air is never far away. Next week looks more interesting as a new LOW, invigorated by a refreshed jetstream, is due to deepen and stay out west due to the blocking high to our east. 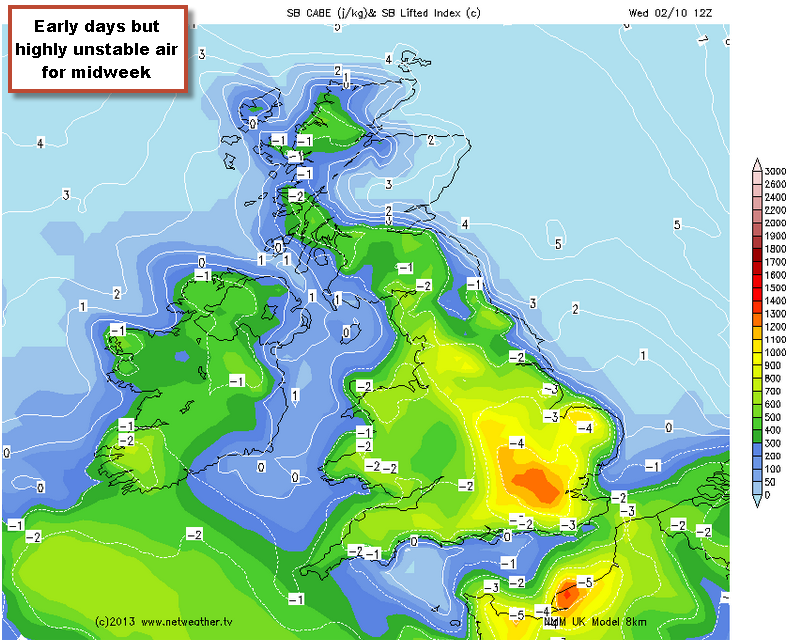 It is set to deliver some waves of warm unstable air across the UK sometime midweek. On a stiff warm southerly wind this might generate heavy rain mid-week, some possibly thundery with plenty of interesting convection. A plume of sorts.